Allow you to convert any words and even file names within content of files to lower or UPPER case. 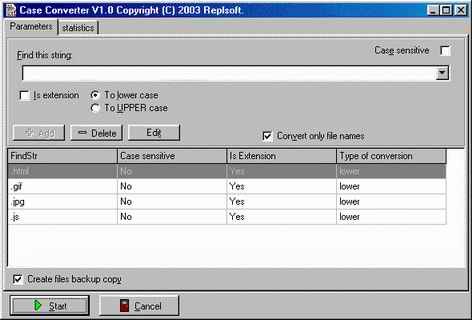 If you want to convert all file names to lower or UPPER case you no need to enter each name. You need enter only extension. It very useful if you need to to move all of our hosted domains from a Windows NT platform to Linux. This is actual because Linux is case-sensitive, both for file names and file content. Qweas is providing links to Case Converter 1.1 as a courtesy, and makes no representations regarding Case Converter or any other applications or any information related thereto. Any questions, complaints or claims regarding this application Case Converter 1.1 must be directed to the appropriate software vendor. You may click the publisher link of Case Converter on the top of this page to get more details about the vendor.